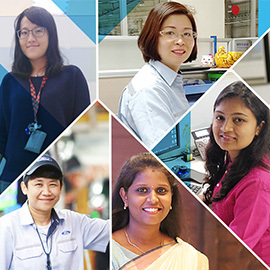 KUALA LUMPUR, Malaysia, 03 April 2019 – Globally, women remain underrepresented in the fields of science, technology, engineering and mathematics, but at Ford, the Company is taking proactive steps to address this imbalance, steadily growing the number of women working in its operations across Asia, as well as the number of women in senior leadership roles. The Company has been providing these tools through a series of initiatives and policies, including establishing resource groups like the Professional Women’s Network (PWN), diversity and inclusion campaigns, and training and development programs designed to help prepare female employees for senior leadership roles. In the spirit of continuing the conversation about women in automotive, this International Women’s Day, Ford shines a spotlight on some of the talented female professionals working in its Asia teams, celebrating their many wins and accomplishments. What makes your job cool? I work with members from different cultures and regions, so we get to exchange information and experiences, which helps us creatively and improves our efficiency. When launching new products or facilities, we spend entire days in the pilot plant and assembly lines troubleshooting. People come up with different ideas for solutions – many innovative projects came about because of this on-site review process. Our cross functional team plays a key role in ensuring all projects are successfully implemented. What do you think is the secret to success? The impossible turns possible when we open our mind to those possibilities. It’s fine to fail so long as we learn from the mistakes we made and make sure not to repeat them. Aim for excellence, think innovative, empower your team and ensure they are getting the recognition they deserve. What makes you a superstar? I am Ford Asia Pacific’s (AP) first toxicologist and chemical product engineer for service chemicals. I also recently established an official process for launching service chemicals in AP, as well as created a general template to facilitate chemical data collection for toxicology review, helping to increase efficiency. What’s something you’ve learned on the job? From an engineering perspective, it’s very clear – when working on a product, we follow a specific set of criteria. But other teams have other considerations, so it’s not always about us. We need to make sure we’re aligned and communicating with each other. At the end of the day, it’s about ensuring the best possible product is delivered to our customers. What do you think is the secret to success? In 2015, I had the chance to visit the Henry Ford museum. While in the souvenir shop, I saw a quote engraved on a ceramic plate – “Whether you think you can, or think you can’t, you’re right.” I bought it and brought it home. Whenever there are changes, the only thing to do is to follow your instincts and do what you think you should. Regardless of the results, everything will turn out alright. What makes you a superstar? I’ve worked on projects designed to address issues related to “last mile connectivity.” In 2017, our team won second place in a design challenge with a hitchhike app, conceptualized to offer dynamic pairing between parties that need a ride to and from the bus or train stop to their office premises, and parties willing to offer a ride. This will help to solve the issue of a public transport user’s last mile. The app has been filed for a patent. What’s a day at work like? I support computer-aided design (CAD) activities for seat commodity during the design phase for cars and trucks. My work focuses on the virtual phase of product development, so each day, we work on maturing the product in a phased manner. The challenge though, is that a design often goes through many iterations to satisfy assembly, manufacturing, service and packaging requirements. All the same, working in design for product development is incredibly rewarding – sometimes, our work leads to new ideas, other times we help solve problems using CAD tools. What do you think is the secret to success? Being a team player pays off. Teamwork is very important in helping you reach greater heights in the professional world. Know how to seek help and guidance from senior members or mentors when you’re in a difficult situation. It’s not always a good thing being too self-dependent. What makes you a superstar? I led the winning team for a design challenge last year, working with five cross function team engineers on a smart trunk storage design. We drew inspiration from various sources, including through customer interviews, competitors’ benchmark, even children’s toy storage boxes. The whole process moved fast, we took only six weeks to form our insights, reach a primary solution, build and trial our operable prototype, and winning the pitch. The design has been filed for a patent. What sent you on this trajectory? I’m one of those cliché examples of my career being totally different from what I studied. I focused on electric ceramics during my postgraduate years, but here I am, a chassis engineer at Ford. Before that, I was working at a home appliances company. I’m a naturally curious person and love embracing challenges and the unknown. Ford has also been extremely supportive, providing open resources, valuable learning opportunities and an incredible team from which I can work with and learn from. What do you think is the secret to success? Try not to complain as it creates a toxic mindset. Be optimistic, keep a clear mind and ensure that you’re always moving forward. What makes you a superstar? I was part of the team that supported the launch of the new Caribou (warm dark brown) color. We also successfully launched the Ford Transit in Vietnam. Aside from that, my day-to-day tasks include analyzing dirt in paint, the paint cost and cost of industrial materials in our Paint Shop, as well as generating quality reports and paint performance daily reports. What makes your job cool? My role requires me to interact with many people across many function groups, which means I’m given plenty of opportunities to learn new skills and knowledge from my colleagues. What do you think is the secret to success? Be curious – it’s important to constantly ask questions as this is how you learn. Seek out opportunities to interact with other people, because this will help you grow quickly. What makes you a superstar? I’ve worked to improve efficiency in various projects and build synergy between different teams. Most recently, I led an exercise in deploying Robotic Process Automation, working with multiple skill teams across our Shanghai and Nanjing offices to automate our business process reengineering system. What do you think is the secret to success? Always keep an eye out for opportunities. Take every chance to engage and grow yourself. I also believe that work-life balance is necessary, and that we should make time for ourselves outside of work.